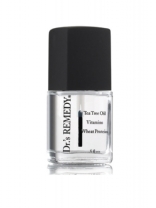 A natural nail conditioner with Biotin & Pentavitin. Biotin part of the complex of B vitamins, improves nail strength and durability. Pentavitin helps to deliver and retain moisture. Use once a week with polish change. For best results use alone for first few weeks, apply twice a week. A multi purpose clear. 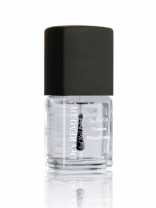 Benefit from the adhesion & nail barrier of a base coat and the wear protection and gloss of a topcoat. Can also be worn alone as a clear for a natural look. 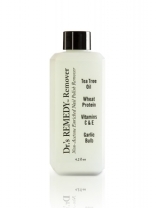 Contains biotin, tea tree oil, as well as cactus, ginseng and kale for added hydration. 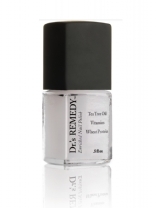 A more natural alternative to traditional formulas, Dr.’s REMEDY, Enriched Nail Polish boasts a proprietary blend of organic ingredients that help strengthen nails and improve their natural colour without harsh chemicals. Sourced from the highest quality actives, our unique formulation contains nourishing vitamins, natural extracts and essential oils that work together to improve the health and vitality of your nails.